The Eden Catholic community was truly blessed this week with many endowment distribution checks given by generous donors. Donors left a legacy behind to support Sacred Heart Parish of Eden, Eden Park Cemetery, St. Michael Cemetery and St. Joseph Cemetery in Lake City. 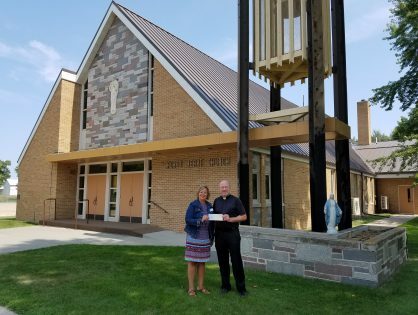 Marne Hult, Gift Planning Officer in the Watertown Deanery, presented checks to Father Brian Simon and these gifts will go towards parish needs along with care and maintenance of the cemeteries, all in perpetuity. Today I delivered some endowment distribution checks. What an honor and humbling experience. The Salvation Army Sioux Falls and St. Francis House are two organizations in this community that are helping people help themselves by empowering them with dignity and love. Because of incredibly generous donors creating endowments with the Catholic Community Foundation for Eastern South Dakota for the ministries that were important to them, the Salvation Army and St. Francis House will receive distributions to continue their good work forever. Each of us can leave a legacy! What will yours be? Faith sustained Claire and Mary Bierschbach through 40 years on their farm near Webster, S.D. They trusted in God in tough years when drought dried up their pastures and storms damaged crops. They stayed strong even when a series of extraordinarily wet years caused the nearby sloughs to swell, slowly overtaking their farm land and leaving much of it unfarmable. “We can’t guarantee what’s going to happen,” said Lois Bierschbach, of the uncertainties of farm life. That reality may be one reason the couple decided to take charge of their estate planning. They turned to the Catholic Community Foundation of Eastern South Dakota for assistance. In 1998, they crafted an estate plan that included a charitable annuity and an endowment to benefit many of their favorite causes. Proceeds from the sale of some of their land was used to create the annuity which provides a regular income throughout their lives and will fund an endowment after their death. The couple retired and moved from the farm to a home in Webster. Claire died in 2014. “The church was very important to them and still is to Mary,” said Catholic Community Foundation Gift Planning Specialist, Bette Theobald. That devotion to the church is reflected in their choices for beneficiaries of their generosity. Their endowment will benefit their parish, Christ the King in Webster, St. Joseph Cathedral and seminarian education among other causes. The couple made adjustments to their investments through the years, adding new charities to the list of beneficiaries. Through the Bierschbachs’ generosity, they have set up six separate endowments which will benefit 13 ministries that were important to the couple, including the Make-A-Wish Foundation, Special Olympics, the Cystic Fibrosis Foundation and Muscular Dystrophy Association. “Now with the creation of the endowments they remember these ministries permanently,” Theobald said. Steve Carlson saw disaster looming, each time he wrote a check to pay a lawn care service for mowing the St. Mary’s Cemetery. As the financial officer for the cemetery account, Carlson paid the bills for the small parish burial area, located a mile north of Bryant, S.D. “It was obvious that we only had about five years – or less than that – of money to operate,” Carlson said. “We were going to run out of money.” Money for the care of the cemetery was coming primarily from funeral memorials and gifts from families whose loved ones were buried there. The parish, which includes only 45 families, also was providing some assistance from its small budget. But population declines in the rural community meant there were only 1 or 2 burials a year of late, and costs for mowing the grass and other care kept rising. That’s when the idea of creating an endowment came about. Carlson, St. Mary’s pastor, Father Richard Baumberger, and representatives of the Catholic Community Foundation of Eastern South Dakota met to discuss options. They decided to set up the endowment. Then Carlson and his family went to work. His mother, Joyce Carlson, jumped into the project wholeheartedly. Attempting to identify relatives of the nearly 150 people buried at St. Mary’s, she poured over small town history books, scouring the internet and matching names with cemetery records. She developed a mailing list of 110 names. Money continues to arrive and the endowment has boosted the cemetery fund about a third of the way to its goal of solvency. Carlson hopes it will continue to grow. Steve Carlson, who grew up in the Bryant area, and lives with his wife, Penny, and their children on a farm north of town, sees the work more as fulfilling a basic responsibility. He said he and his family have helped take care of other rural cemeteries around the area over the years, realizing that over time, connections to families of those buried in the aging cemeteries, have declined. “You just kind of have a spot in your heart for these cemeteries,” he said. Ralph and Rose Counter knew well the strain poverty could place on a family. The Sioux Falls couple spent hours volunteering for church and community organizations and saw those struggles manifested in their work with homeless families, in regular visits to prisoners and in seeing young children unable to afford Catholic education. When Rose Counter died in 2003, her husband, Deacon Ralph Counter, knew just what to do to honor her memory. He worked with the Catholic Community Foundation for Eastern South Dakota to establish an endowment for the benefit of St. Lambert and O’Gorman High School students. 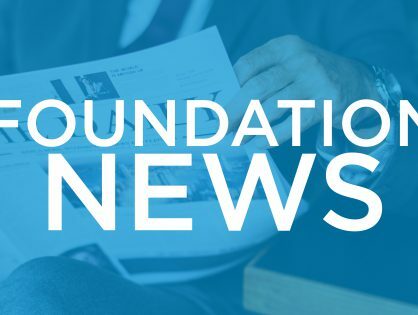 “Rose knew how important Catholic education was in the life of a young person who did not have much in their life,” said Andrew Bartell, Director of Planned Giving, with the Catholic Community Foundation. Wayne Stuwe first met the staff of the Catholic Community Foundation for Eastern South Dakota as a volunteer running a spotlight for a Christmas concert. Foundation President Mark Conzemius and other staffers were in Hoven, S.D., several years ago to help St. Anthony parish produce their own Christmas concert, which became known as “Christmas on the Prairie”. The annual event brings professional soloists and symphony musicians to the small town in north central South Dakota. A few years later, when Stuwe and his wife, Janine, decided to set up a family endowment, they turned to the Catholic Community Foundation. They took advantage of a match program the foundation offered in commemoration of the 125th anniversary of the Diocese of Sioux Falls. “We hadn’t thought about it really, but the matching grant made it a little more enticing,” Wayne Stuwe said. The Stuwe’s named their local parish, St. Anthony of Padua, in Hoven, as well as seminarian education and youth ministry as the beneficiaries of their endowment. The Stuwe’s had taught CCD classes in their home for several years and enjoyed the experience. They hope their gift will assist their parish in continuing the classes and other ministries. Wayne has served on the St. Anthony parish council and both he and his wife have volunteered for a variety of other activities in the parish of about 300 families. 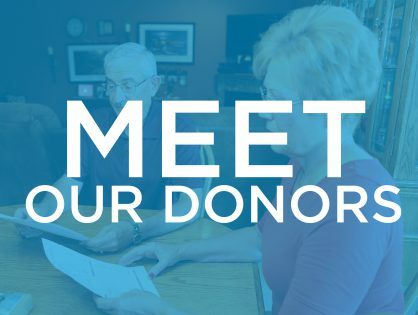 Conzemius said the foundation helps individuals like the Stuwe’s “be good stewards of the gifts that God has given them.” There are 746 permanent named endowments, like the Stuwe’s, administered by the CCFESD, totaling $55,703,044. All of them benefit ministries determined by the donors, Conzemius said. The Stuwe’s believe they have a responsibility to support the ministries of the Catholic Church and this endowment embodies their gratitude and commitment. “We always felt we needed to support more than just our local parish, but also the diocesan church,” said Wayne. Conzemius said the Catholic Community Foundation provides many opportunities for individuals to do that. “For those who care about Catholic values, the Catholic Community Foundation is a great vehicle for their charitable giving,” he said.